Ludo’s heart lifted when Gnomes’ ferry came into view. It was good to see some civilisation even if it was somewhat basic. Ludo was confident it would serve their purpose and allow them a decent night’s sleep and a chance to get some well needed rest. The travelling, the Reaver attack and herding of the horses made for a tiring journey. Stephan sighed heavily and scanned the sky. Late afternoon. A warm pub and dry bed. The priest wholeheartedly agreed with the woodsman. “A bed is what we need. Tempers have weakened and there is a long road ahead. I will ask for guidance as to the best route for the morning.” He dismounted and lead his horse into the inns’ yard. Ludo helped Stephan with the horses. With so many it was going to be difficult to cross the river and he figured also expensive. He accepted with gratitude Maruc’s healing. Miklos gratefully ate the rich steaming river-fish stew that was served in the hostel and heated his sore feet by the log fire that burned merrily in the grate. He was a townsman and struggled with the countryside life. The beer was sending him off into a dreamless sleep. It took a great deal of effort to make his way to bed. It didn’t take long to go to sleep. Feldard took full advantage of bar too once more prove that dwarves had a superior constitution. He ate and drank until the others of his party were either passed out or headed to bed and still he was, for the most part, sober. It was moments like this that he missed the camaraderie of other dwarves. He finished off his last pint and headed to the room he was sharing with the elf. The dwarf settled onto the straw mattress and rested, though sleep didn’t touch him until the eastern sky began to brighten with dawns first light. Adding it all together—stabling for the two dozen horses, food and drink, beds for the night, the ferry fees—it had been a costly night of rest. However, the party was flush with coin thanks to their various recent adventures, plus the future sale of the horses would bring additional funds as well. The group made it to the other side of the Shutturga River without incident. The Duke’s Road, the most traveled route in the Duchy with Kelven on one end and Specularum on the other, lied before them. In the distance a large group of wagons and horsemen approached from the direction of Kelven. Ahead of them, three mounted armoured figures approached the party. Either way the priest serruptitiously curled his hand around the handle of his flail. Miklos moved off to the left of the party to get a good field of view and to ensure no one could get in the way of his magic should things turn sour. The dwarven warrior, seated atop the tamest of the party’s mounts, had been argueing sourly with the beast since leaving the Ferry. Feldard snorted at the priests words – yeah like anyone would believe an armor clad dwarf with next to no horsemen skills was a drover. Yet still, Feldard nudged his mount ahead of the party to intercept the approaching armoured horsemen. They appeared to be approaching at social trot not a full charging gallop. The dwarf slowed his horse and did his best to keep it still as they came into conversing range. As he acknowledged their return greetings he noted their physical state and weapons. (Do they seem weary or recently injured, wary of them in turn?) “Where do you hail from? 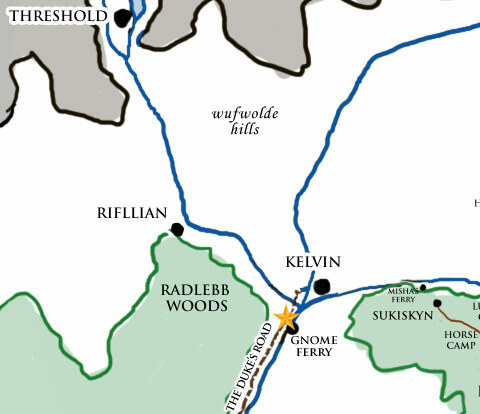 Do you travel by way of Kelvin?” Hinting in the question that Kelvin might be his groups destination. It was a bit of purposeful misdirection – just in case. Stephan rode along with Feldard to greet the other riders. He was glad to hear Feldard’s subterfuge regarding their destination. Soon, he knew, they’d take the road west toward Rifllian and thence to Threshold. No need to be verbose about who they were and where they were going. Stephan did what he could to keep the dwarf’s horse calm. Why can’t the dwarf impart an understanding to his mount?, he thought. The horse, however, was the mildest of the bunch and seemed content enough. A few minor verbal clicks by the woodsman kept the horse calm in the face of this encounter. The previous night’s rest and Marucs clerical healing had worked wonders. Ludo felt fresh and energised, it was a good day to be on the road, not to hot or cold. Ludo rode towards the front of the group and kept the horses moving, which they seemed content to do without much trouble. As the caravan came to view and Feldard and Stephen trotted to the front to converse with the three armoured riders, Ludo herded the horses in his vicinity to one side of the road to allow the wagons to pass. He observed the armoured riders looked like professional caravan guards; tough able men. He wondered if he knew any of the guards but could not recognise anyone from this distance in amongst the dust kicked up by the wagons and animals of the caravan. He made sure to keep some of the Elven steeds between him and the caravan to provide an obstacle should the situation turn ugly.